Discussion in 'Edged Tools' started by JerseyDevilJeeper, Apr 16, 2019. Actually more pleased than I thought..
Straight from the British Isles in *N695 Stainless with Olive wood handle..
I’ve been so happy w my Grizzly so it was a logical south-lateral move for EDC if that makes any sense. It’s 7.2" (180mm) overall with a 3.5" (85mm) blade that is 3mm thick, Scandi Ground and razor sharp outta the box. I got it w the multi carry sheath plus I’ll prob have Mr P. wrap it in tan for me. Much lighter than I thought.. it’s literally 1/2 my D2 Grizzly. It’s gotta be the steel of course, If you went by weight it’s like comparing a monkey wrench to a screwdriver ... but as a tool it’s more like my 4-Door lifted JEEP Wrangler Compared to my wife’s stock JEEP Cherokee.. both quite capable, even in a snowstorm. But you wouldn’t take my lifted rig to work every day but you’d definitely want it outside the cabin when you and your buddies are hunting. I really need suggestions for my Olive wood as I wasn’t that happy w BLO on the Griz’s curly birch. ExAF1N1, Vanitas, Paul Foreman and 5 others like this. Looks like a great stainless steel EDC option. Not sure on what to use on Olive wood..... linseed oil has always worked for my needs. I have been using "Howards Butcher Block Conditioner" for years with great success. I use it not only for my wooden handles, but also on my Carbon blades when storing. One HUGE PLUS for me, is it does not darken light colored woods like boiled linseed oil does. 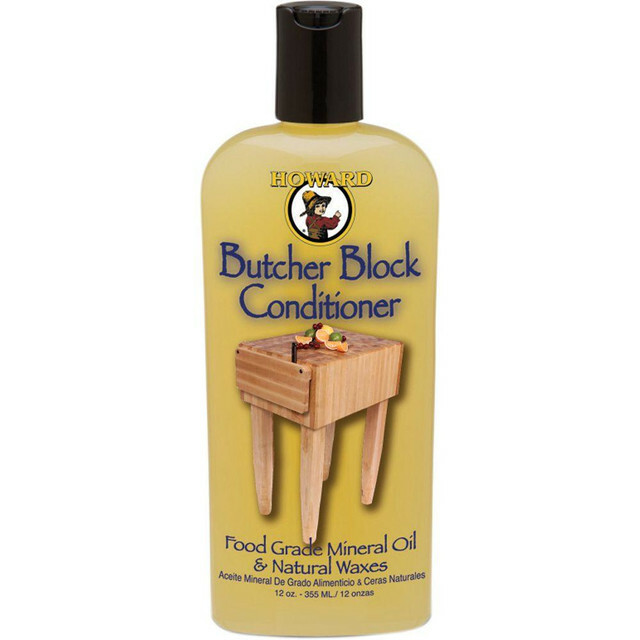 Treat your butcher blocks, cutting boards, turned bowls and utensils to specialized wood care with this conditioner. Food-grade mineral oil penetrates deep and, along with water-resistant beeswax and carnauba wax, rejuvenates wood and prevents drying and cracking. Meets all FDA regulations for direct and indirect food contact. 12 fluid ounces. Ptpalpha and Duncsquatch like this. Gonna hit depot today, Thanks Blue! Just follow the label or is there a better way? blue333 and ExAF1N1 like this. Is it too late for my Grizzly’s handle w this?? Even after I did the multi-day BLO treatment? That BLO will keep it the same color it is now for a while. It's penetrated in the wood. If it was me in this position, I would soak a rag in isopropyl alcohol (the higher the alcohol % the better) and rub the handle. The alcohol should help remove/absorb some of the BLO. Even better would be Acetone. After a few minutes of air dry time, then I would soak/rub the Howard's Butcher Block Conditioner in really well. Keep in mind, neither of these options are permanent. The alcohol/acetone option would just cut through the time of said BLO to dry out of the handle naturally on it's own. Again, this is just what I would do rather than waiting months for the BLO to dry out of the handle. Once the Howard's is rubbed in, that should be as dark as the handle will ever get, as long as you keep using it & nothing else. Blue, thanks brother; that’s what I was lookin for !